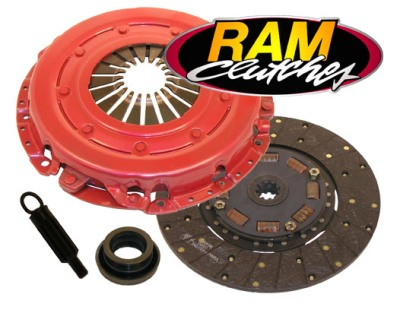 * Includes throwout bearing These RAM HDX clutch kits are ideal for street/strip applications. They produce 30-60 percent more clamping pressure over stock and feature ductile iron, explosion-resistant pressure rings that meet SFI certifications for use in competition. The HDX disc provides the smooth engagement necessary for maximum performance and drivability. A new flywheel or the resurfacing of the existing flywheel is required before installation . Our Quality & Finish will leave you with a grin from ear to ear as it is the Best looking unit available for your Ford Mustang or Cobra. Quality Construction: No one else gives you the bold clean styling of our Aftermarket Dress Ups, Suspension and Performance Parts for your American Muscle Car like UPR Products! Fits these Vehicles: 1986 1987 1988 1989 1990 1991 1992 1993 1994 1995 1996 1997 1998 1999 2000 5.0L 4.6L V8 LX GTS GT Mustang Roush & Saleen Vehicles. Made in the USA!